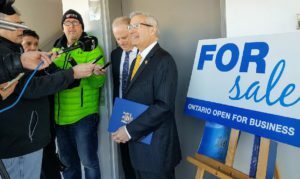 NORTH BAY — Ontario’s Government for the People has announced a more efficient process for selling surplus government properties. The improved plan will reduce red tape, create more affordable housing and long-term care spaces and put more money in people’s pockets that will benefit Nipissing. The government’s new streamlined process for selling surplus properties will remove an estimated 150 days of administrative time to dispose of properties, generating an estimated $105 to $135 million in revenue over four years while also saving the government an estimated $9.6 million annually in liabilities and ongoing maintenance costs. The plan also includes support for some of the province’s most vulnerable. The new plan will more easily identify which properties could be used for affordable housing and long-term care projects. Additional government departments and levels of government can also benefit from reduced red tape so that identified properties can be efficiently put back to productive use in communities across Ontario.